I got into the sport of archery in high school. Led by a friend of mine, I found the sport fascinating, and I followed with stars in my eyes all the way to the store. The place I purchased it at had a full size shooting range in the back and tools to help their customers pick the right bow and accessories while trying them out. In the process of setting myself up with the perfect bow, I got into the challenge of archery, and learned that I actually had a bit of talent. It has been a while since I regularly made it to the target range, but my love for the sport has never waned. The photo below was taken after a few recent practice rounds, and shows my grouping, and though overall it is nothing to be excited about, it was nice to see a few arrows right on top of each other. The reason I tell you my background with archery is because of how much it has to do with successful marketing. 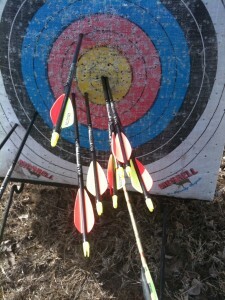 Here are a few key lessons I have learned about marketing from my time in archery. 1. Practice is Mandatory | During my senior year of high school, all of those arrows would have been touching. The more I practice at hitting the center of the target, the more often I would succeed, and that success would come in groupings (consistently hitting the bulls-eye with each arrow). If you don’t keep at it, the ability you once had will fade away over time. 2. You Must Aim at the Center | If you only try to hit the target, your arrows will be scattered all over the target, with many missing it completely. The only way to consistently hit the bulls-eye is to “aim small, miss small” (The Patriot movie). In other words, the tighter your focus, the better your hit. 3. Know the Target and its Environment | In order for complete success, you need to know everything about your target. How big is it? Are you outside? What’s the wind going to do? How far away are you standing? Is there a vertical change between you and the target? The more you know about your target and its environment, the easier it will be to hit the center. Knowing your target also means that you know how to speak to that target, or in other words, craft that perfect message. You will find that if you follow these three rules in marketing, you will see significant growth in the number of prospects knocking down your door. You will find an engaged audience and have the right tools with which to get them interested in your product or service. Happy hunting!